Sitting on the terrace in my dressing gown, with a mug of coffee and binoculars, as one does, at 3.00 am, I watched the ‘Super Moon Eclipse’. What was striking was how long the red Earth shadow was lasting, hours rather than the minutes we’ve seen with eclipses of the sun. I guess that is due relative distances. And it wasn’t as cold as recent nights, down to 2C the night before. At 6C it felt mild. This is a modest photo compared with those on media broadcasts, but it was taken with my phone. The wonderful thing was that here on Exmoor the night skies are unpolluted from man-made light – other than when the cat set off the yard light – and the sky was clear, no clouds, so that stars in their millions and billions and huge distances could be seen from horizon to horizon. Toward half past four the brilliance faded as a veil of cloud came over. 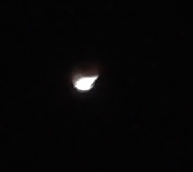 The super moon’s eclipse was a sight to remember; I’ll be in my nineties when the next opportunity comes in the 2030s.